Hospitality. This is one of the areas I’d like to grow in 2019. I have two groups of people in my life. The relative few who can walk in my house unannounced because they’ve proven themselves loyal and love me despite my messes. And, those for whom I frantically clean (ahem, move things to closets) before they arrive so that things are perfectly tidy when the doorbell rings. But, what about all the days and people who fall between those groups? Interestingly, my husband is a natural host. He’s never met a stranger. He keeps up with people and invites them to lunch. He picks up the phone to call when I would opt for a text. I used to joke that his random acquaintances would join us for Christmas. And then they did (and I hope they do again). People he met on the side of the road we now visit on vacations. I’ve learned a lot from Russell. 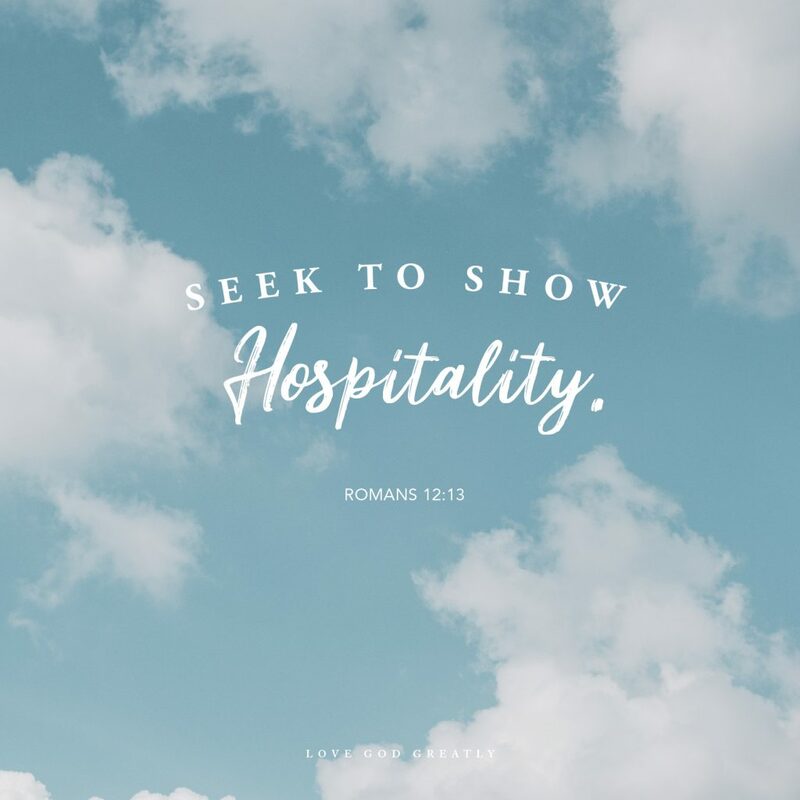 As much as I’d like to blame it all on personality differences, I’ve wrestled with today’s verses and with why I’m frankly just not that good/consistent/comfortable at practicing biblical hospitality. I’m an intentional encourager of people around me, but I’m comfortable within my close-knit group and I don’t venture out of that bubble as often as I should. Excuses bounce through my head; I’m …. busy, tired, working, selfish with my time, vain about the appearance of my house, lazy, scared of being turned down, uncomfortable with starting the conversation. Being raised in the southern US, the word hospitality immediately conjures up images of Pinterest perfect dinner parties, beautiful tables and charming, poised hostesses. But the hospitality referenced in Romans 12:13 calls us to “Share with the Lord’s people who are in need. Practice hospitality.” This isn’t a discussion of paper plates or china. No centerpieces are required. Instead, it’s a call to welcome people into our lives and into our homes. It’s a call to be inclusive rather than exclusive. It’s a command to help people who are struggling. God’s grace is the ultimate act of hospitality. As believers, we are the church. We are the remnant that the watching world eyes with mixed suspicion and interest. We preach that all are welcome, but if our doors are locked tight, our lives tell a twisted version of the gospel. But, be encouraged. This doesn’t need to be a Martha Stewart production. It doesn’t need to look any certain way. The act of opening doors literally takes away physical barriers that separate people. It also figuratively tears down barriers within people; stereotypes and stigmas fade when there is an avenue for conversation to happen and for real relationships to form. As we step into 2019, let’s be brave and take a step outside of our comfort zone. Let’s invite people into our homes and into our lives in a fresh, new, intentional way. Let’s listen to their stories and make friends out of strangers. Let’s be spontaneous. Let’s build community and fellowship. Let’s share life. And through this, may our guests see God’s hospitality and the hope of the gospel reflected in us. 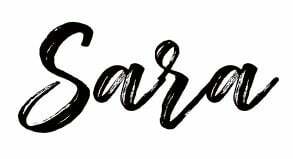 Saras blog is so me! Thank you for sharing and giving me something I can work on this year. God bless you! Thank you for sharing. Though I don’t necessarily think of Biblical hospitality as having people to our HOMES, our dwelling places, as much as having people in our lives. Sharing our hearts, our issues, our situations, whether challenging or encouraging. We don’t have people over our house much either, but I welcome them to chat, reach out, pray with, etc. This to me is more about showing Biblical hospitality if the home environment isn’t feasible. I know some women feel bad their house is “too small, too crowded, disorganized”. They shouldn’t feel they can’t be hospitable. They should meet up in coffee shops, their church, a café or bookstore, or even park bench. And offer their ear, their arms, their hearts. That is also being hospitable, no? God wants us reaching, welcoming, praying for, sharing and loving, wherever the place! I totally agree with you! Hospitality is never limited to our homes and can be shared in so many ways! Thanks for reaching out.